While the rest of the school is working on persuasive writing, our Kindergarten is working on informational writing. The teachers and I met back in December to plan some goals that we had for student research of informational topics. It was important to each of them that students have experience locating information in a variety of places, but to specifically look at content that matched their developmental and reading levels. Our print collection in the media center already has a variety of texts on a variety of levels, so I felt like they would find enough resources in the nonfiction section that would meet the needs of several topics. 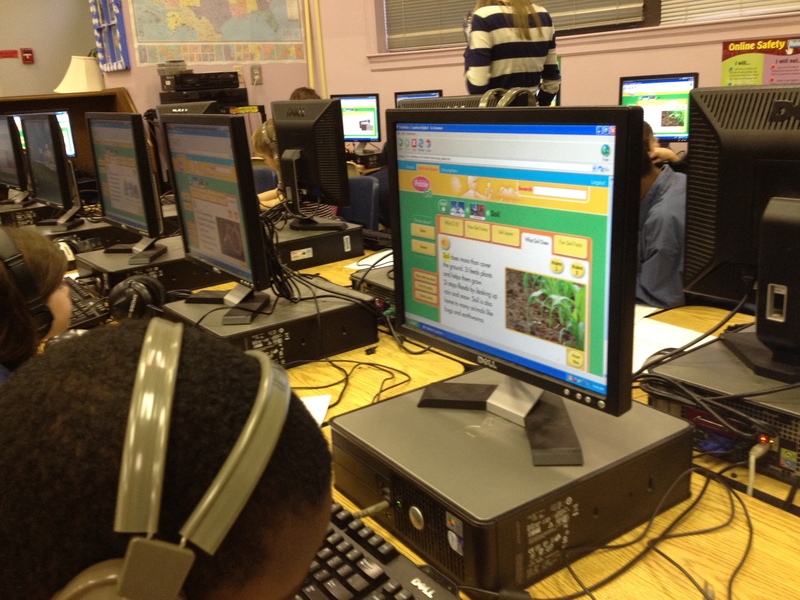 The challenge came with finding a digital resource that would meet their needs. We have access to great databases such as Encyclopedia Britannica in our state Galileo database, but even Britannica didn’t seem to get at what we wanted. Fortunately, we were able to get a one-month trial of PebbleGo from Capstone. PebbleGo has three main databases: animals, earth and space, and biographies. The content targets a K-2 audience, but I’ve found that the topics are appropriate for all of our grades and really match the reading needs of many of our readers. The content is broken down into headings and students have the option of reading the content themselves or having a professional narration read to them. There are also videos, charts, maps, timelines, and more within each heading. Kindergarten chose to do a beginning stage of research by assigning all students similar topics within their science standards. Some students learned about rocks while others learned about soil. In our collaboration, we decided that they needed a very basic graphic organizer. 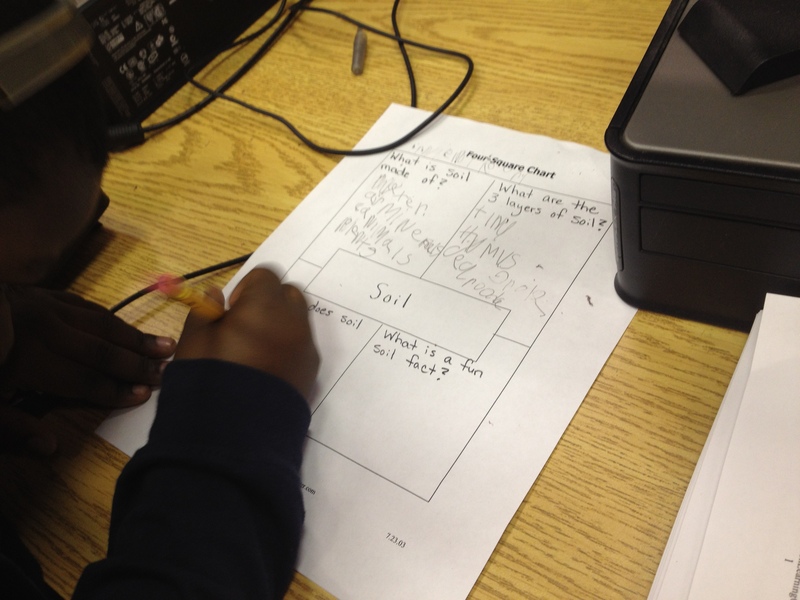 We chose a four square organizer with the topic in the middle surrounded by 4 questions that students would answer. They could answer the questions with text or even draw pictures in the spaces. Each teacher booked a one hour lesson. I introduced PebbleGo and how research is all about asking questions. Students generated some sample questions about rocks before I showed them the 4 questions they would explore. I briefly clicked through the pieces of the site and showed the feature that would read the content to students. We also looked at the 4 questions and thought about which tab would answer which question. When students seemed too saturated with information, we moved to the computer lab where PebbleGo was already loaded on their screens. I was immediately amazed at the level of engagement but also the number of firsts. For so many students, it was the first time using a mouse, a keyboard, the internet, a graphic organizer with set questions, and more. It was easy to get overwhelmed by the number of questions that students were asking, but when I stepped back and took a deep breath, I was amazed at how excited the students were. I was amazed by what they were remembering from what they heard regardless of whether or not it made it onto the graphic organizer. There were 4 adults helping students: the teacher, student teacher, my paraprofessional, and me. We knelt down beside students and had conversations about listening to information more than once, writing down keywords rather than complete sentences, using a graphic organizer, and more. In the end, students left with several facts written down about rocks and soil, but they also left with excitement about coming back again to use the computer for research. When we checked in with them at the end, every student said they wanted to come back for more. The teacher commented to me that this lesson just made her want to use the computer lab even more and how this was all a process. In order for students to get better at researching and using the computer, they have to do it more. It can’t just be a single lesson in the lab. Wow! Even though the lesson exhausted me at the very beginning of the day, it energized me with possibilities. This entry was posted in Lesson, Research and tagged capstone press, early learners, early readers, kindergarten, pebblego, research skills. This is so exciting! We have a lesson in our upcoming joint project about rocks in second grade. If we have any extra space on the page, I hope we can include a link to this kindergarten version. How exciting to watch young learners get excited by content without the requirement of adult mediation! Thanks so much. I would love for it to be linked if possible. I get to do this again twice tomorrow, so we’ll see what new learning comes from the 2nd and 3rd time leading this.